Earlier in the week, standing in a crowded subway on the way to work, I noticed several guys around me wearing messenger bags. This is not a new phenomenon; in fact, it’s pretty non-newsworthy. A friend of mine who studied abroad with me four years ago (and probably still uses his) had one. When I first saw it, I complimented him on his anti-traditional backpack. But I really had no idea just how popular these would become. It is my contention that dudes want to carry some kind of a purse but haven’t found the most practical, stylish or society-accepted one – until recent years. An ex-boyfriend of mine got a new laptop when he started a new job last year. He began carrying it to and from work in an over-the-shoulder laptop bag. It’s exceedingly rare to see someone walking around this city or standing on the subway with nothing on his person. I only say ‘his’ because I have never seen a woman who isn’t carrying something; it can be as small as a credit card but women do not walk around this city with nothing. (Which brings up the whole topic of leaving the house without stuff like identification or keys – the thought panics me.) More often than not, I see women in New York carrying two purses – one giant one as a gym bag and the other as her actual purse. Seriously, without cars we become nomads. The bottom line is, men have finally found an acceptable way to have a purse. And I quote, “Several boys and men were actually among the first to use messenger bags to help make their load lighter.” Check out the article that goes into a brief history on messenger bags. Truth be told, there’s absolutely nothing wrong with wanting to carry your crap around with you, especially in a big city like this. But we as a society are extremely slow to change strong notions (turnover on gay marriage, anyone?) and men carrying something akin to a purse is one of them. The second key factor is the strap that enables a guy to sling it over one shoulder and across the body. In this way, the guy isn’t carrying it over his shoulder like a woman does with her purse (although I am perfectly aware many women prefer the across-the-body look – I am not one of those). Also, if he doesn’t want it in front of him (more purselike? ), it can sit behind him – acting as a giant wallet where he can reach behind and grab what he needs. Lastly, it avoids having to carry a bulkier, heavier and sometimes hotter backpack. Why does someone need to be a student to carry crap around? He doesn’t. Enter the messenger bag. Dudes, if you haven’t tried one, pick up a cheapy one and see if you like it. Make sure it’s comfortable – that shoulder strap across-the-body thing is really important. I saw a video on YouTube showing how to make one out of trash bags. (I mean, really….) So they range from practically free to going all out and buying one from Gucci, if you wanna get retarded serious about where to drop your dollas. Add one to your gift wish list – see if it changes your life. I’m betting it will. And, in the process of attempting to be unique, you’ll become part of the majority. Messenger bags define “hip” by being nearly an anti-fashion statement. They look casual and trendy all at once – and like a denim jacket or a concert t-shirt, they can actually become even cooler the older and more beat up they become. 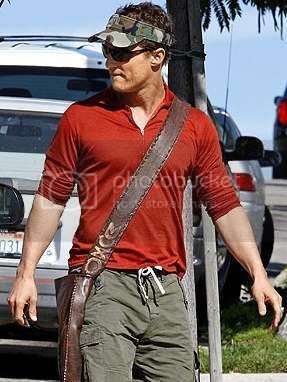 Matthew McConaugheeeey sporting his bag. And what’s on this list of “dude approved” gifts this year? A messenger bag made from recycled tractor tires! Folks, I can’t make this stuff up. Okay you got me… I’m commenting on your blog! of course, these are delusions of grandeur! imagine rural people who live in caves commenting that dudes are wearing purses. I see nothing wrong with them and honestly, I like how the bag is slung over the body, too! Thanks for your input!